If you are looking for information on the Total Golf Adventures franchise business opportunity, Total Golf Adventures franchises or TGA franchising , then you have come to the right place. The mission of Total Golf Adventures (TGA) is to provide America's youth with access to the game of golf through programs that build life values, instill confidence through achievement and offer a fun and educational experience. 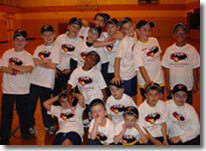 TGA was created in 2003 as an overnight golf camp in California. At the end of summer, many parents expressed a desire for golf programs that took place during the school year. TGA quickly realized the need and demand for a program that brought golf directly to children and didn't require transportation to and from a facility. 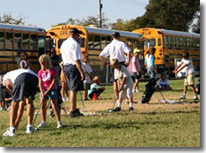 Thus, in the fall of 2003 TGA offered the company's first-ever at-school, after school golf classes at six elementary schools in Los Angeles. The response from schools, parents and students ignited the flame that now surrounds TGA's golf ball and the only national after school golf program. Through strategic relationships in both the golf and education industries, TGA now has a two-flamed attack introducing golf to and providing ongoing golf programs for youth. The TGA business taps into a new niche in the golf industry that includes the 90% non-golfing population within the United States. That niche is the only national at-school after school program. From marketability in the schools, students are then transitioned to other TGA events such as camps and tournaments. TGA businesses derive revenue from in-school programs, community programs, camps, equipment and apparel sales among other avenues. Total Golf Adventures offers a turn-key solution to owning your own business in the golf industry. TGA is releasing exclusive geographical territories to professional golfers (PGA, LPGA and USGTF members), entrepreneurs, golf enthusiasts and business people who want to make a difference in their community. Since igniting the flame just three years ago, our franchises are currently being implemented across 23 states in 36 territories. A TGA franchise requires an upfront investment after which TGA provides the tools, support, brand and infrastructure needed to help you generate revenue quickly while growing your business efficiently. TGA HQ is known for supporting our franchises in every way possible providing the utmost attention to our territories. As a young, innovative and quickly evolving company, we are promptly there for our franchises; just ask them! TGA uses a five (5) level enrichment program to give students a framework for success which creates high retention rates leading to repeat customers. Programs offered at schools or alternative facilities such as YMCA's, churches, parks, etc. An operations manual (300+ pages) consisting of all sales, marketing, training and administrative documents vital to your business. A 3 to 4 day training visit to your territory to familiarize you with TGA, sell school accounts for you, provide sales training, set up your business and a review of all documentation we provide. Access to TGA's support network consisting of approved national suppliers, strategic partners, TGA owners, weekly emails, bi-weekly conference calls, online message boards and our annual National meeting. Immediate PR efforts locally and nationwide to introduce your business market and brand your business. National partnerships and strategic partnerships with golf and education organizations that strengthen your brand to schools and parents, your two biggest clients. National buying power with TGA Approved Suppliers/Vendors to significantly lower the variable costs of your business. "It's nice to be on the ground floor of a National Golf Program that has the potential to grow the game of golf more than any other program." Sean Kicker, PGA Member and TGA Owner. in an untapped niche within the golf industry.